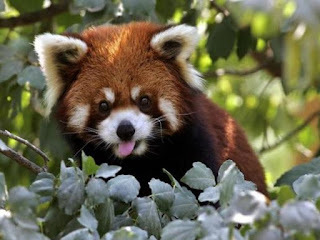 Tezpur-Tawang Highway : A Red Panda, which comes under the category of endangered animals, accidentally found itself in the inhabited area on the Tezpur-Tawang Highway, and was rescued by the Sashastra Seema Bal (SSB) on Tuesday. The Red Panda, after it was being chased and attacked by stray dogs, was rescued by the troops of SSB led by Anjani Kumar Tiwari AC with the help of local villagers. After confirming the species by the forest authorities, the Red Panda was taken to a safe location and released in the forest. Red Panda's habitat majorly lies in the Eastern Himalayas. The population of Red Pandas is seeing a decline due to loss of nesting trees and bamboo, leading to their forest home being cleared. Along with habitat loss, poaching and inbreeding depression are other reasons for its population loss. The International Union for Conservation of Nature (IUCN) has classified the Red Panda as Endangered due to its wild population being estimated to be less than 10,000 mature individuals.